Learn how to make a recipe for cherry cheesecake. If you have been looking for one of these recipes, you have come to the right place but first a few words about this delicious fruit. My first memories of cherries are very good ones. When I was little I remember going to my sister Gloria’s house. She was young and married and had a nice little white house. My favorite thing about her home was that she had a huge cherry tree in the front yard. This was the only time I got to eat cherries; when they were ripe on her tree and we were visiting. I spent the entire visit in that cherry tree eating all I wanted. I loved those cherries and today I still love cherries. Later in my young life someone (I can’t remember which family member) bought me an ice cream sundae. It was topped with whipped cream and a maraschino cherry. I was so enthralled with that cherry that I guess that is the reason I cannot remember who bought me the sundae. That was the best cherry I could imagine! But only one! Back then I never saw these in jars or anywhere for that matter. Certainly it wouldn’t have been something in my home! For years of my young like I thought that these were only made one at a time for ice cream sundaes. I was really happy when I learned that they come in jars! By this time I could only imagine learning how to make a recipe for cherry cheesecake. Since the early days of my life I have found that there are many different types of cherries; I love all of them. They are separated into two main categories; sweet cherries and tart (or sour) cherries. There are many varieties of the sweet cherries like I ate from my sister Gloria's tree. (Actually, it was Gloria who first learned how to make a recipe for cherry cheesecake.) Among them are the Bing, Lambert and Ranier. Like strawberries and most other fruit, all cherries should be bright and plumped when picked. Sweet cherries are rarely cooked to eat; honestly they wouldn’t last long enough to cook, they taste so good. The sweet cherries are what they use to those delicious maraschino cherries. The first in the production of cherries are the tart ones. These are almost never eaten raw. The Montmorency is the favorite sour cherries and is used in pies, puddings, dumpling and cobblers. Even though they are sour they are still delicious and very flavorful in desserts like cheesecake recipes. 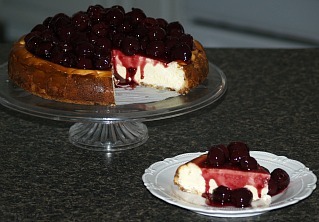 Depending on which recipe for cherry cheesecake determines which cherry you will want to use. By changing the cherry pie filling to strawberry filling this can also be an easy strawberry cheesecake recipe to make. Reserve 1 cup of dry cake mix; combine remaining mix, 1 egg and oil in large mixing bowl. Mix ingredients until crumbly, press into bottom and ¾ inch up sides of greased 9 X 13 inch baking pan. Combine and blend cream cheese and sugar; add 3 eggs and reserved cake mix. Beat on low speed and gradually add milk and flavorings; mix until smooth. Pour into crust; bake for 45 to 55 minutes until center is firm. Combine in large bowl cream cheese, eggs, sugar and vanilla; mix well on medium speed. Pour into crust and bake 25 to 30 minutes; remove from oven and chill 15 minutes or more. Top with pie filling and sprinkle pecans over top; refrigerate. This is a Black Forest recipe for cherry cheesecake using maraschino cherries in the topping. Very good! Combine crumbs and butter; press into bottom of 9 inch spring form pan; bake 10 minutes. Combine and blend cream cheese and sugar on medium speed until smooth. Add eggs one at a time beating after each addition; blend in melted chocolate and vanilla. Pour into crust and bake 45 minutes; loosen sides from pan and cool before removing pan. Chill. Prepare topping for cake: Combine cherry juice, Kirsch, cornstarch and lemon juice in small saucepan. Stir mixture and cook over low until thickened; add cherry halves and toss to coat. With pastry bag and large holed tip line rim of cake with whipped cream; spoon cherry mixture in center. Serve this recipe for cherry cheesecake with additional whipped cream if desired. Combine and blend flour, nuts, brown sugar and butter in 9 X 13 inch baking pan. Bake 15 to 20 minutes or until golden brown; STIR ONCE WHILE BAKING. Remove from oven and reserve ½ cup of the crumbs for the top. With a spoon firmly press remaining warm crumbs into 9 inch pie pan; chill crust. Blend together cream cheese, almond and sugar until smooth; spread over crust. Fold fruit filling into whipped cream; spoon over top of cream cheese mixture. Sprinkle top with reserved crumb mixture; refrigerate until set. 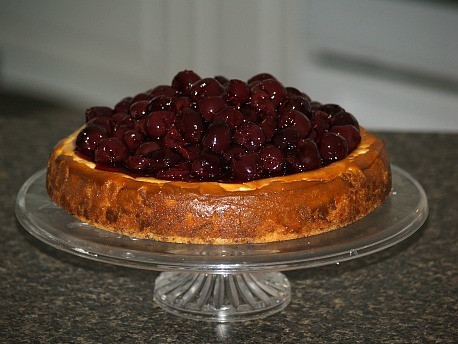 This is a fantastic recipe for cherry cheesecake for a special occasion. In medium bowl combine crust ingredients; blend well. Press into bottom and 1 inch up sides of ungreased 10 inch spring form pan. Beat cream cheese and sugar in large mixing bowl until light and fluffy. Add sour cream, lemon peel and vanilla; blend well. Pour into prepared crust; bake for 50 to 60 minutes or until center is set; cool. Refrigerate for several hours or overnight; before serving remove sides of pan. Combine cherries and cornstarch in a large skillet. Cook over medium heat until mixture boils and thickens, stirring occasionally. Heat brandy in small saucepan over low heat just until vapors are visible; DO NOT OVERHEAT. Using long stemmed match carefully ignite brandy in saucepan. Pour ignited brandy over cherries and stir gently. Spoon cherry mixture over wedges of cheesecake. NOTE: If you do not want to ignite brandy just stir the brandy into the cherry mixture and heat. FOR CRUST combine and mix crumbs, sugar and butter; press in bottom of 10 inch spring form pan. FOR FILLING beat together cream cheese and sugar until creamy. Slowly beat in cream; beat in eggs, kirsch and almond until smooth and creamy. Pour mixture into prepared crust; bake about 1 hour or until center is set. Cool on rack 15 minutes; run knife around edge to loosen from sides. FOR TOPPING combine juice, flour and cornstarch in saucepan. Cook and stir over medium heat until thickens; add cherries stirring until hot. Set off to cool; put in bowl and refrigerated until ready to use. TO MAKE CRUST combine flour, butter, sugar and nuts in mixing bowl. Blend mixture well; press in bottom of 7X11X1 ½ inch baking pan. Bake 15 to 20 minutes; cool completely. TO MAKE FILLING beat cheese, sugar and milk in mixing bowl until smooth. FOR TOPPING sprinkle the 1 cup nuts over the cheese mixture. Beat whipping cream gradually adding sugar, beat until stiff adding vanilla. Spoon whipped cream over the nuts; spoon cherry pie filling evenly over the whipped cream. Place in refrigerator and chill overnight; serves 9 to 12.